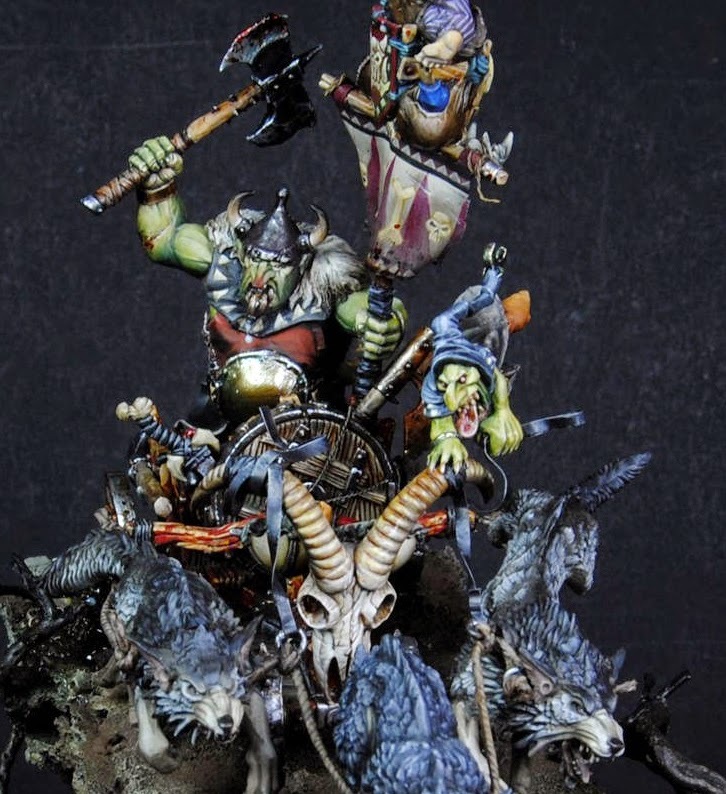 Welcome back to Mini of the Week, where every Friday I will find a miniature from around the web that exemplifies an aspect of our hobby and share it with you. It's always cool to see an older model get an update with an amazing conversion. Grom the Paunch is a classic goblin special character known for his unusual size and heftiness. This hobbyist has really captured the character in a realistic and intimidating manner. I could really imagine this guy running havoc through an Empire battle line. 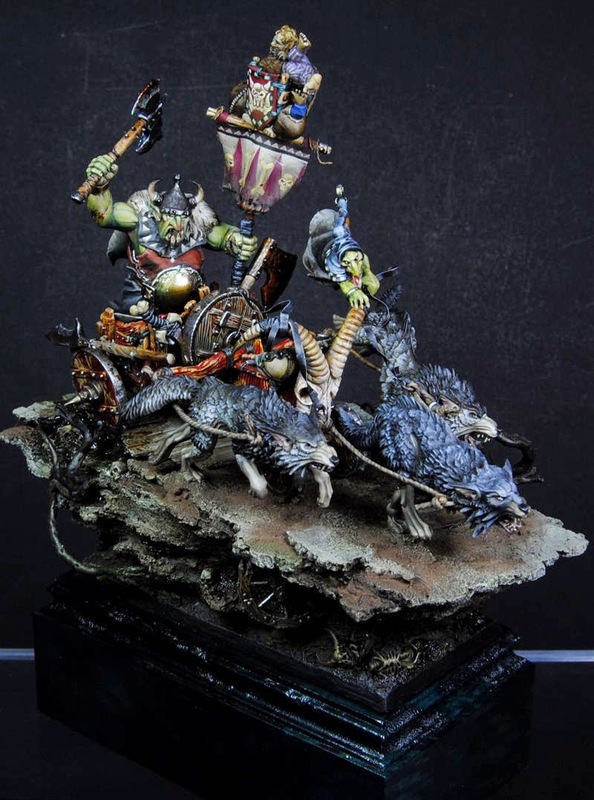 Not only is the sculpt for Grom himself top notch, but he has really captured a sense of movement and dynamism with the chariot. The Fenrisian wolves are some of the most versatile and beautiful sculpts to come out of GW in the past few years. 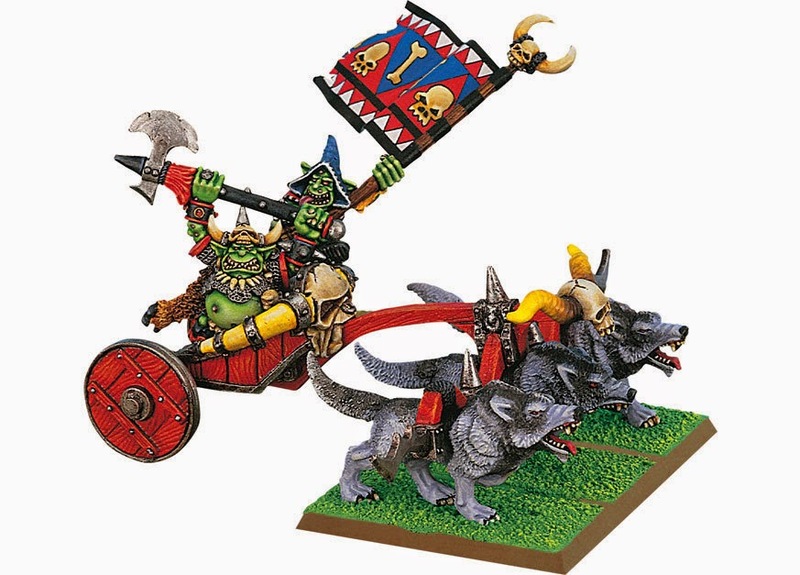 I'm sure every goblin player rejoiced when they saw them, no more horrible wolf riders or chariots. The addition of the Fanatic hanging on for dear life to the wolves is a really nice little touch as well. It's also a good tool to show the size of Grom from comparison. What can I say about the painting besides that it's flawless. He has achieved a very realistic, desaturated look with the goblin skin. Sometimes the green that GW has chosen as their orc/goblin skin tone can look too cartoony, but he nailed it here. The additions of free hand around the model and blueish hue to the wolf's fur really help to tie the whole model together. I don't know what else I can say about this mini, it's just as close to perfect as you can get. Just for comparison here is a picture of the original model. Be sure to check out more views of it on Cool Mini or Not and show the artist some love if you like it. What do you think of this model? If you have any models or have seen any around the web that you feel deserve to be the Mini of the Week feel free to send them to me at tylerm@mengelminiatures.com with the title "Mini of the Week" and a brief description of how you painted it or a link to where you found it.